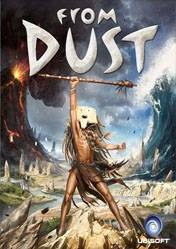 In From Dust, players assume a god-like first-person perspective from which they manipulate an archipelago environment in an effort to save, and enlighten, a nomadic tribe. With a spherical cursor, the user controls certain types of matter - namely soil, lava and water - in real time. Lava cools to form solid rock, vegetation propagates in soil and spreads naturally once a village is built, and moving water quickly erodes terrain. Physical changes to the world occur extremely rapidly, allowing players to restructure islands within minutes.